Since my twins were born a few months ago, I’ve been getting a lot of use out of my Canon HF100 AVCHD camcorder (if you’re looking step up to HD yourself, check out our HD camcorder buyer’s guide). After shooting some footage, I import it into iMovie ‘09, edit it, export it as a 720p HD movie, then upload it to Vimeo for hosting and embedding in my blog. After making a few dozen such videos recently, I have the workflow down pat. And I’m also really bored with iMovie’s limited set of transitions and titles. 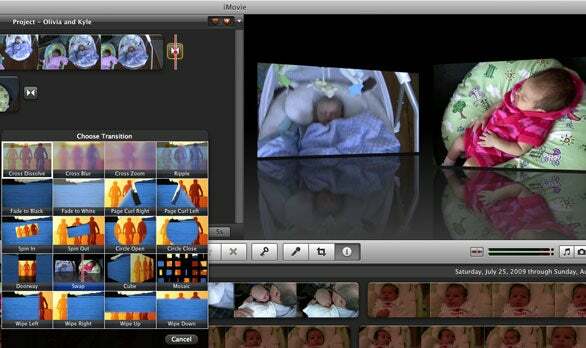 Let’s return to the old days, before Apple’s Randy Ubillos completely redesigned iMovie as part of the iLife ‘08 suite. Back then, people like Bruce Gee sold awesome collections of transitions, effects, and titles for iMovie users. With them, people could create movies that didn’t use the same tired effects that everybody else had. Back to today: Although I love the simplicity that iMovie ‘09 offers for quickly cutting together and sharing a movie, one casualty of the new architecture (which debuted with iMovie ‘08) is that there’s no longer a way for companies to create third-party plug-ins that you can add to iMovie. That means every iMovie user on the planet is stuck with the same set of effects. Seriously, how many “Circle Open” transitions can you watch before wanting to gouge your eyes out? The Apple-supplied solutions are either return to iMovie HD 6—which Apple stopped offering as a free download in January of this year—or use Final Cut Express or Final Cut Studio. The first option is no option at all: I found earlier version of iMovie to be poorly designed and difficult to work with. And stepping up to one of the Final Cut products is not only overkill, it also defeats the quick-and-easy nature of iMovie ‘09 that I find so helpful. So I say to Apple, please give developers the means to create effects for iMovie '09. If that's technically unfeasible, at least create more of your own. My family will thank you. iMovie's transitions are nicely designed, but we need more options. Jonathan Seff is a Macworld senior editor.